In recent years there has been an increase in the number of dentists and physicians that are prescribing antibiotics for controlling bad breath. While antibiotics are effective in treating many infections and diseases caused by bacteria, you should know why using antibiotics as a cure for chronic bad breath is a short-sighted and potentially risky approach. Here’s a short science lesson: Bad breath bacteria are a certain type of bacteria called “gram-negative bacteria.” These particular bacteria do not need air to live and can easily thrive in the biofilms (coatings) on the tongue and under the gums — (places with little to no air). That is where they produce volatile sulfur compounds and other odor-causing molecules that create bad breath. 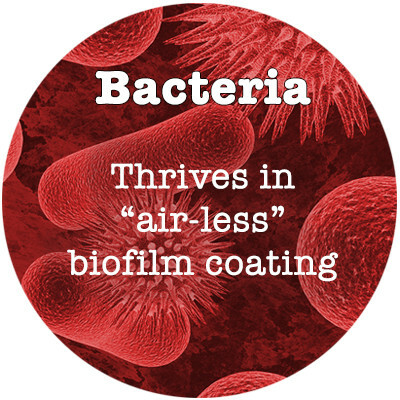 What’s a biofilm? – a living organism with live bacteria, a food supply, and a way to excrete their waste products – into our mouths in the form of smelly, odor-filled compounds. Here’s the pitfall with using antibiotics to control bad breath….. In order for the body to deliver antibiotics to a specific area, they must be carried by the tiny arteries called capillaries, which reach all of the soft tissue in the body like internal organs, tissues and skin. As long as there is a blood supply to the targeted area, the antibiotics have an excellent chance of working. But, there is no blood supply into the biofilm! That is why antibiotics have a limited effect. In order to achieve a positive result, the continual use of antibiotics is needed. A little more “biofilm” anatomy….. 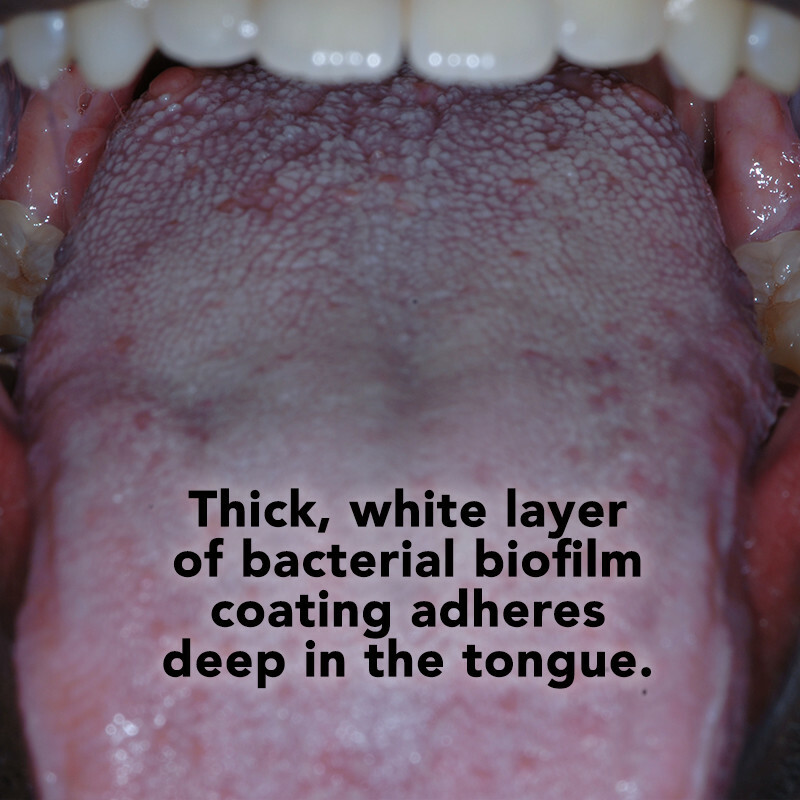 Since the coating on the tongue can be as thick as ¼” and contains both live and dead bacteria, dead blood cells, debris, mucous, proteins from food, and dead skin cells from the inside of the mouth, and mostly because it adheres tenaciously to a surface (tongue and gums), it is considered a biofilm. But, there is no way to deliver the antibiotics directly to the biofilm, and even if there was, it would need to be repeated time and again just to lower, not eliminate the bacteria. 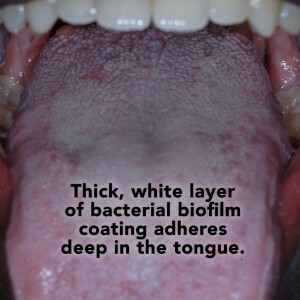 Of course, antibiotics can be used to swish in the mouth like a mouthwash, but this technique will kill bacteria on the surface of the tongue only, not in the deep layers of biofilm. Using antibiotics to treat bad breath is only minimally effective. Keep in mind you’ll be dependent on using them on and off for the rest of your life in order to control chronic bad breath! And what about prolonged use of antibiotics?…. You’re also probably aware of the use of antibiotics to fatten cattle and poultry. A recent article in the Wall Street Journal said the FDA has warned food suppliers to curtail their use of antibiotics because they are leading to a new class of bacteria: superbugs. These bacteria are antibiotic-resistant and their rise in prevalence is fueled by the overuse of antibiotics. Using antibiotics that kill oral bacteria is just one example. Why? Because there are much more effective ways to eliminate bad breath. After 22 years of clinical research, having tried every technique that has been written in journals and many that I discovered, there is still only one way to eliminate the biofilm: the direct way. In fact, the most renowned doctors and scientists in the field of halitosis research specifically state that biofilms can only be removed by mechanical means. 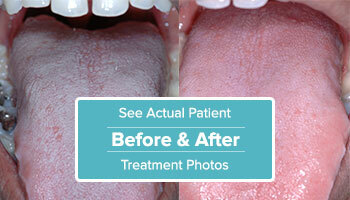 That is where our process of Tongue Rejuvenation comes in. Gently, but meticulously, we remove the biofilm coating over the entire tongue to eliminate the bacteria that cause bad breath. Once removed, proper at-home techniques can keep people bad breath free for life. Why use antibiotics with their limited effectiveness, need for constant repetition, and potential health risks when there is a technique that completely removes bad breath at its source?